Don McGlichie’s immaculate International DCO has a few surprises hidden beneath. The D in DCO is the model designation and CO stands for cab-over. This one’s a DCO4 which means it’s a bogie drive. The only part of this banger that’s still 1965 is the cab. The chassis and rear end came courtesy of a Kenworth W900. A Cummins BC3 nestles under the DCOs shiny shed. The standard DCO interior could be best described as Spartan. Don has built his own dash and softened the place up a bit. Kenworth Airglide irons out the bumps out back. 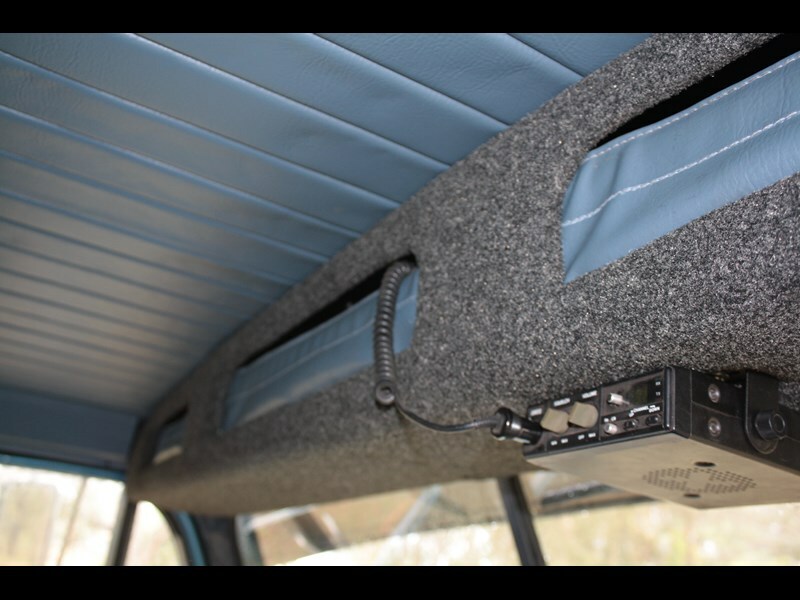 A neat custom made overhead console provides some much needed storage. 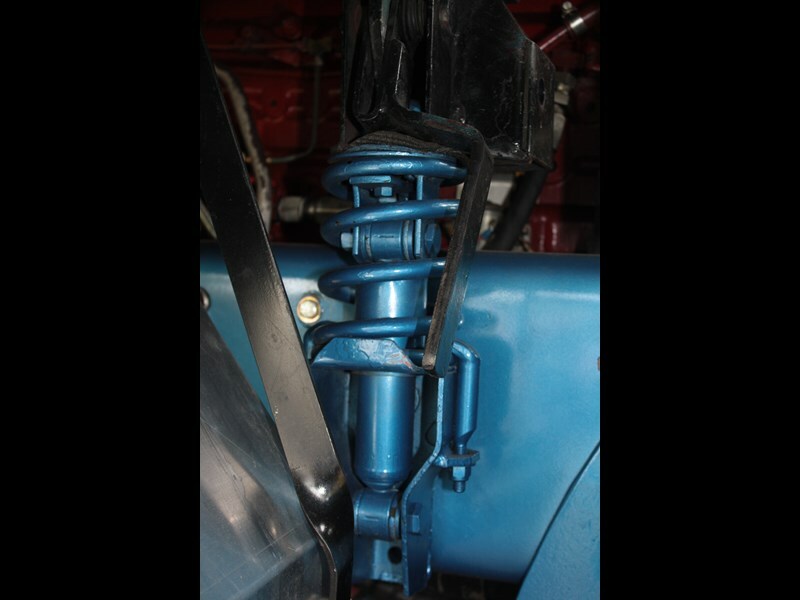 Volvo G88 cab suspension does a great job of taking wiggle and jiggle out of the ride. Oh the irony, Don’s old DCO in Retriever guise tows his new Atkinson home after a breakdown. Back in it’s heyday out west! The Inter hauled some big loads in its time. A little known and quite rare truck in Australia, Matt Wood catches up with an International DCO and an owner with a story to tell. There was a time when 200hp was something to brag about in a truck. 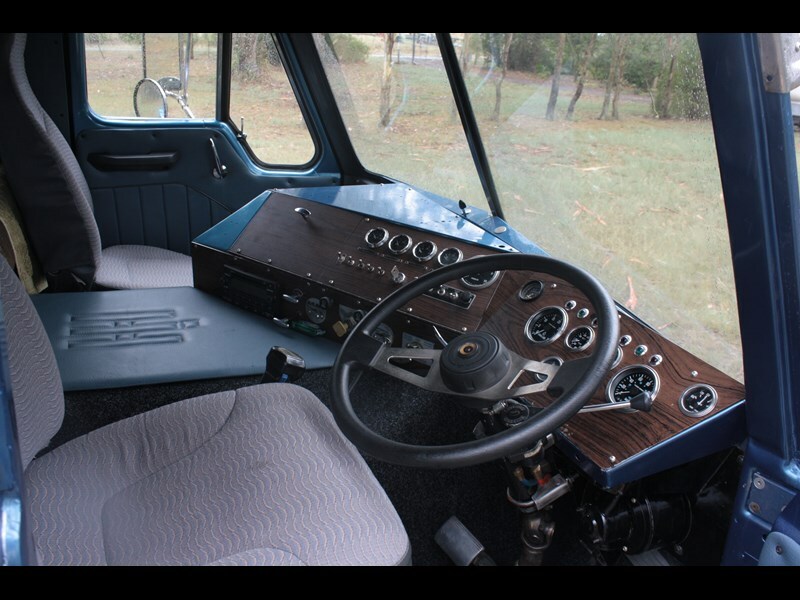 It was also a time when sleeper cabs were a luxury in long haul trucking, let alone a prime mover that only had one gear stick. As the old saying went, "if it’s got headlights you don’t need a bunk." The International DCO isn’t exactly an iconic model. It doesn’t feature highly in the soot stained annals of Aussie highway myth and folklore. For a start the fully imported cab-over was only on the market for a couple of short years before the arrival of the more popular cab-over Transtar that replaced it. Yet for a brief time it was regarded as a big highway banger, an All-American lightweight that packed a heavy weight punch. Its moment in the sun earned the Emeryville USA built Inter a few loyal adherents over the years as a new chapter of Australian long haul trucking dawned. That new chapter of big bore trucking was to see a Kenworth factory open locally and European brands like Volvo start to take root. 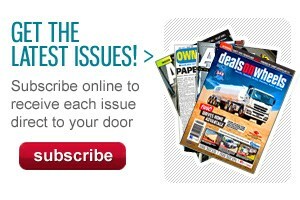 Older readers of now departed Truck and Bus magazine may recall the face of Don McGlinchie. He was often photographed driving the latest and greatest that the industry had to offer as a road test driver for truck reviews. One memorable cover photo from the early 1980’s shows a stern faced Don steering a then brand new International T-Line up Mount Victoria. The same pic also shows our very own mustachioed and rather hirsute Steve Brooks driving the XD Falcon camera car just in front of it. Even today, Brooks still describes Don as arguably the finest driver of a truck he has ever come across and makes no secret of his admiration for the man who was, in so many ways, a greatly respected and trusted mentor. Don has been a loyal proponent of the International brand for most of his career as an owner-driver. And the immaculate International DCO you see gracing these pages was originally bought by Don back in the late 1960s. 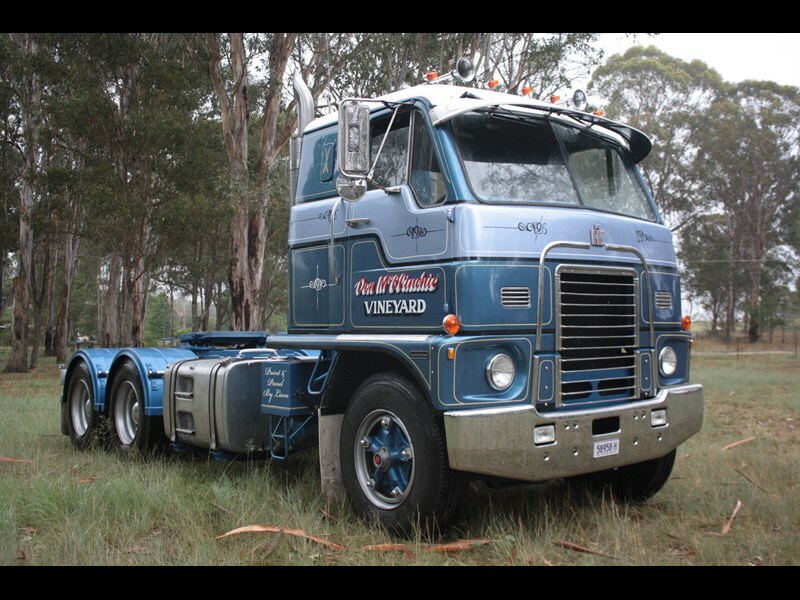 Starting out as a mechanic in Sydney’s outer West back in the 1950’s Don was lured into the world of trucking by the promise of big money even if it meant hard graft. A mate by the name of Ken Archer had just bought a truck for brewery work and young Don was earning a little extra on the side helping Ken out with it. Finally Don decided to take the plunge into being an owner-driver, "I thought I could make a dollar, " he recalls. So in 1959 he bought a second hand Ford F600 prime mover. "That truck nearly broke me on the first trip!" Don muses, "I took on a load for Antill Ranger, a load of wool from Lake Station out West of Cunnamulla." The poor old Ford Y block V8 threw a leg out of bed on the trip back to Sydney, the stricken truck was towed to the top of Mount Victoria as Don tried in vain to get an advance on his pay to repair the stricken Ford. The answer was a resounding no, so Don had to handball the load of wool onto a mate’s truck to get it in and to collect his payment. The Ford continued to prove troublesome so, Don bought a new F600 thinking it would be more reliable. It wasn’t. "Why Ford thought that a small block V8 used in a family car would be any good in a truck is beyond me," says Don. A repo Commer Knocker then came Don’s way for the right price, "That was the truck that started to make me some money." The Commer ran mainly Sydney/Perth with a pan full of refrigerators with Don at the wheel. At this stage Don was still using the train from Port Augusta, however once he started making a dollar he upgraded to a 6V53 Detroit powered International R190 before again upgrading to a single drive Mack B61-673T. He then decided to tackle the Nullarbor dirt on a regular basis rather than sit around on the train. The selling point of the International DCO back in the day was it’s relatively big power and light tare weight. All DCO models arrived on the boat from the US as slim line day cabs and most were single drive. Power came via Cummins NT initially at 250 and 280hp, but later turbo engines copped improved piston cooling and could pump out 335hp. The right hand drive configuration for Oz meant that the American front mounted turbocharger had to go so it was relocated to the rear of the engine. Behind the Cummins sat a 12-speed Spicer transmission putting power into Inter diffs. The DCO you see here came Don’s way in 1969, it had been sitting in a Sydney transport yard owned by Phil Murray and it caught Don’s eye. Many Aussie DCOs had been converted to sleeper cabs, usually just a ¾ style add on. This truck however had the full Ansair sleeper treatment. Never one to make do with what he was being presented with, Don set about making the Inter a little more bomb proof to cope with the somewhat optimistic loads that were being slung onto it’s back. The International diffs got the flick in favour of 44,000lb Rockwell SSHDs. And while the Spicer has its fans, Don flicked this in favour of a 15-speed overdrive Roady. "The Spicer just didn’t stand up in the dirt and dust". He also fitted a Ross power steering set up and the Cummins copped a Jake brake for extra braking bite. The hard-working DCO didn’t just run Sydney to Perth either. Don and the Inter also took loads of mining equipment to the Northern Territory and even to Mt Isa in QLD. But time and toil took its toll and by 1974 Don was looking to have a break and the DCO went up for sale. 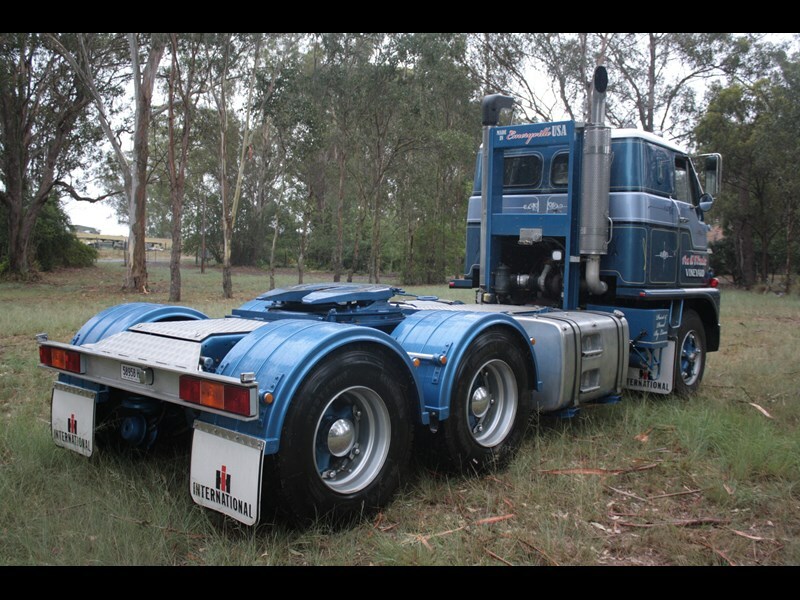 The tough cab-over was then sold to Retriever Towing and subsequently became a regular sight on Sydney’s road network for nearly four decades. After a year off doing odd jobs and moving trucks around, life on the road beckoned to Don again, and in 1976 a new Detroit 892T powered Atkinson soon appeared in the driveway, not long after Don also scored the Truck and Bus test driver gig. The placcy Atki hauled steel out of Clyde Rail and spent years pouring tonnes of steel into Newcastle out of Sydney. Don finally parted with the Atkinson in 1990. He then scored a job as an employee driver hauling a fuel tanker subbied to BP. 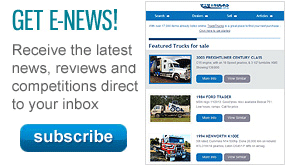 Over the last 20 years Don has spent his time delivering new trucks all over the country for dealers. Now aged 80 Don still finds time to turn a wheel moving a V8 Supercar display trailer around the countryside. With all that experience behind the wheel under his belt, I just had to ask what his favourite truck was out of the dozens he’s driven over the years. He only thinks for a split-second before replying, "The Transtar 4700 I drove on the fuel job," "It had a Detroit Series 60 in it and would have to be the nicest truck I’ve driven." But in 2012 Don had the chance to be reunited with his old DCO. The International tow truck had been working hard for it’s money but the time had come for it to be retired, "It was working up until the day I bought it," says Don. The whole rig was backed into Don’s workshop and the mammoth task of returning it to its former glory commenced. Unfortunately like most restos things didn’t go according to plan. 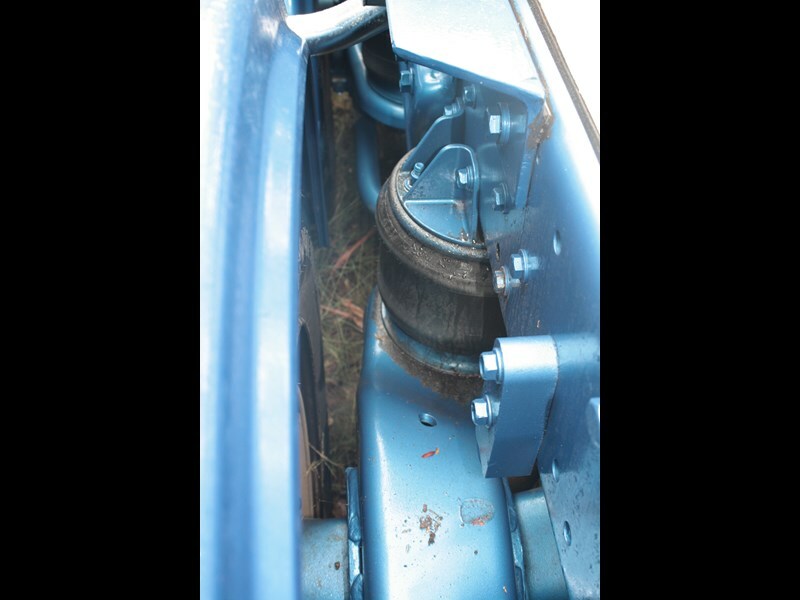 Don pulled the cab off and started repairing the numerous cracks and dings in the chassis rails. But it was only after investing hours in the front end that he pulled the wrecker body off the back, "the chassis rails were like swiss cheese, full of cracks, holes and patch up jobs," Don says wearily. Adding to these woes the DCO was on its 3rd or 4th engine as well so a repower was also in order. The rivet counters out there may be a little irked but the DCO scored a new chassis courtesy of a shabby old Kenworth W900. A 14 litre Cummins was also slotted between the rails. This will no doubt annoy the KW fans out there as well! The KW theme continues underneath with Kenworth Airglide suspension ironing out the bumps out back. But clearly Don has always done things his own way and the end result, regardless of rolling component heritage is stunning. I climbed awkwardly into the passenger seat as Don fired up the Cummins BC3 residing under the cab. The big red donk coughed into life and idled away smoothly as we rolled out of the shed. In the driver’s seat Don looks as if he’s a part of the DCO, his work hardened hands deftly pluck the gears as we bobtailed through the outer-suburban streets. The interior too has had the McGlinchie treatment. As another former DCO driver from back in the day attests, "There wasn’t much in the cab of those things, they were pretty much just a shed inside." Don has crafted his own wrap around dash that echoes the lines of those found in a 1980’s T-Line or Atkinson. A padded overhead console also provides a place to store knickknacks. The sleeper with it’s upholstered panels also looks cosier than one would expect from a truck that dates back to the mid-1960s. Then it’s my turn to climb behind the wheel. Cab entry and egress must not have been a high priority back in 1965! It’s clear very quickly though, that Don’s resurrection of the International hasn’t just renewed it, the truck has been transformed. With a sweet Holset whistle floating over the Cummins rumble I let the DCO unwind a little. It’s an evocative sound that recalls the 1980’s more than the 1960s. A time of festoon lights, bad hair and chattering AM CB radios. The 15 overdrive is a smooth shifter and the whole truck feels like you could hitch it to a loaded trailer and hit the highway. It feels that solid. The nostalgia trip comes from peering through the split windscreen as the top mounted wipers judder across your field of vision. As the tacho climbs the Cummins let rip with a satisfying bellow, but with no load on there’s no need to push it. Bobtail it’s a relaxed drive. The ride itself is also smoother than anticipated, no doubt this is partly due to the Airglide rear end as well as the G88 Volvo cab suspension that Don has fitted to the back of that smooth American cab. Like so many classic car and hot rod builds this truck reflects the dedication, innovation and workmanship of its owner. 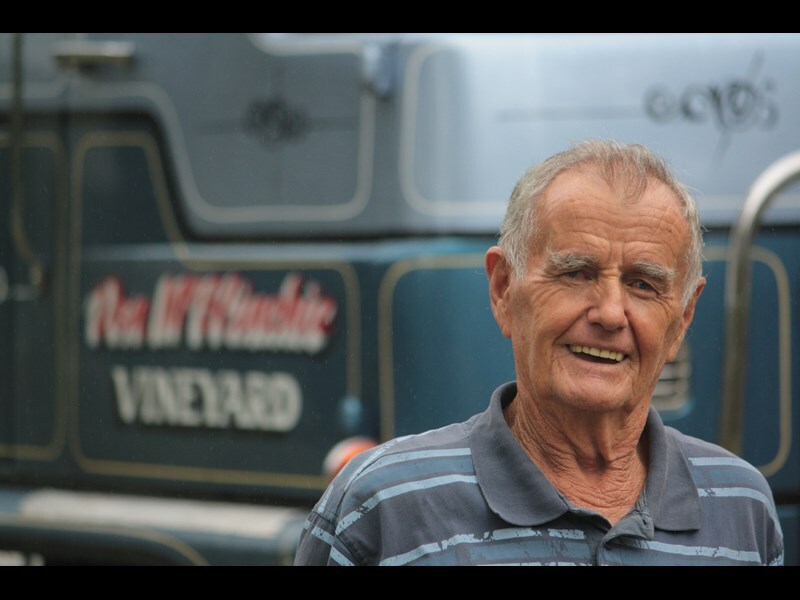 Don didn’t build this truck to satisfy historians and purists, he built a truck that reflects him and the long history that he has had with Australian trucking. This International DCO is both an understated worker and a gleaming tribute to the sort of smarts and dedication that can only come from years of hard work and experience. Victorian based tanker company Knight’s of Kilmore operated arguably the best-known and certainly largest International DCO fleet in Australia in the late 1960s. Jack and Allen Knight remained loyal International customers for decades. The first DCOs to join the Knights fleet used naturally aspirated 250hp Cummins power and retained the 12-speed Spicer ‘box, later trucks got the turboed 335. These trucks were initially single drive but Knights fitted some with air operated pusher axles to bump up carrying capacity. As one former Knights driver recalls, "They were a very quick truck in their day, but the inside of the cab was all metal, they were bloody cold!" 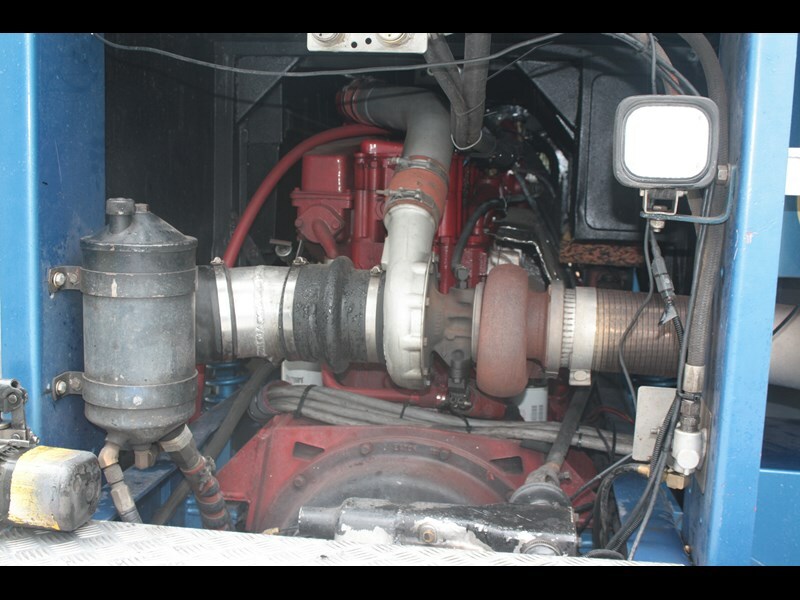 The company fitted two DCOs used for interstate with Recar sleeper cab conversions. These trucks hauled chemicals between Melbourne and Sydney and even marine crude to Whyalla. During the Blowering Dam project near Tumut in NSW, Knight’s trucks were tasked with keeping diesel up to the machinery. "We had to negotiate a dodgy bridge across the river to make the delivery," the former driver recalls, "In winter we’d be towed through the mud up to the tank farm by dozer!" Knight’s stuck with the Spicer transmission in the International, "A couple of us used to carry a bottle of olive oil with us," the driver says, "If we lost our range change we’d pull over and pour a couple of drops of oil into the air cylinder on the top of the gearbox, that’d get you going again!"